Samir Mayekar’s career path has taken him from Northwestern to the White House and then back to Northwestern. Now, in an office in a technology park on Chicago’s South Side, he’s confident he has found the place where he belongs. “This” is Mayekar’s job as CEO of SiNode Systems, a company that develops advanced materials for the lithium-ion battery industry. SiNode’s technology has widespread applications for battery-based technologies such as smartphones, drones and electric vehicles. The venture encompasses all that energizes the 32-year-old Texas native — global issues, a unified team and clean energy. It is a path that Mayekar never anticipated as a political science major at Weinberg College, but one that emerged as he learned about himself and the world. 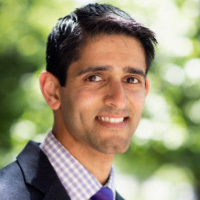 After graduating from Northwestern in 2006, Mayekar took a consulting job at Marakon Associates. Two years later, he left that role to join Barack Obama’s 2008 presidential campaign. After the election, Mayekar worked at the White House for two years, then joined the Overseas Private Investment Corp., a U.S. government agency that invests in emerging markets. That experience led him to another passion: the energy sector. As he grew to appreciate the role that energy plays in propelling economic development and improving quality of life, Mayekar came to believe that clean energy presented the most sustainable path to global good. In 2011, Mayekar returned to Northwestern to pursue his MBA at the Kellogg School, reacquainting himself with the campus where he had met his his wife, Emily Haak ’07. When he and three classmates learned about the innovative battery research being conducted by Northwestern engineering professor Harold Kung, they convinced Kung to allow them to commercialize the technology. Mayekar and his teammates launched SiNode in 2012. He predicts the company will be in the market within the next three years.